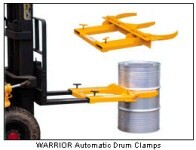 The WARRIOR Automatic Drum Clamps fit quickly and easily onto the forks. They are secured via hand screws. 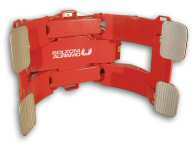 Once fitted, the drum clap will automatically pick up, transport and deposit drums without the driver needing to leave the truck. 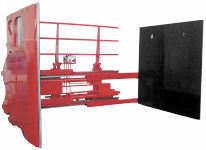 Bolzoni Auramo Lift Truck attachments are marked CE and are produced in conformity to the C.E. Directives (98/37/CEE) as well as to Rules EN 729-2. Sideshifters, Clamps, Fork Positioners & All Other Attachments. Cascade (UK) Ltd., 3 Kellbrook Road, Parkhouse Industrial Estate, Openshaw, Manchester. M11 2DD.